Protect an unfinished home from the elements—and a finished home from the consequences of plumbing disasters—by starting with a durable subfloor built from the right materials. Though building codes treat both materials equally as “structural panels,” plywood and oriented strand board (OSB) are quite different compositionally. 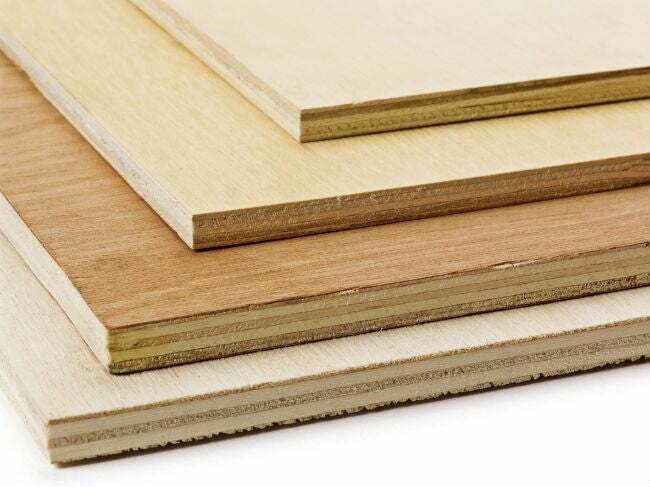 Plywood is made from glued thin strips of wood veneer (called plies) that are layered at alternating 90-degree angles and placed in a hot press; the resulting cross-laminated and layered material is structurally enhanced and resistant to the expansion and contraction that affects solid wood. OSB, on the other hand, consists of 3-inch to 4-inch strands of wood that are also layered and configured in a crossing pattern, then glued and pressed. When plywood was developed to replace solid-board sheathing for subfloors and decking, builders were generally reluctant to switch to the new product, which ultimately became the standard for subfloor applications. So, unsurprisingly, when OSB came on the scene as an alternative to plywood, detractors were quick to point out its deficiencies. Its affordable price aided its growing popularity, and it soon surpassed plywood as builders’ choice in home construction—floors as well as wall and roof sheathing. Which is the better option, plywood vs. OSB? Well, each has their own strengths and weaknesses when used as exposed decking or subflooring. • OSB is considered more structurally consistent than plywood. Since a sheet of plywood consists of several large veneers of wood, it’s susceptible to instances of knots and other imperfections (which, if aligned, could create slightly softer spots throughout the material). 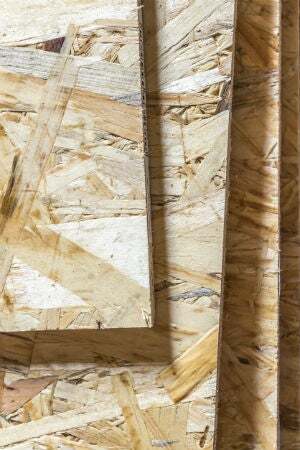 Meanwhile, OSB compacts as many as 50 layers of strands into a single sheet the same thickness as that plywood, ensuring a much denser—and heavier—product throughout. • OSB absorbs less moisture, but plywood dries out faster and more completely. How the subfloor materials react to water matters during both an open-air construction phase of a house as well as homeownership when a leak or flood might compromise the subfloor. Slower absorption of moisture is ideal for throwing a tarp out over an unprotected subfloor or catching a leak before real damage. 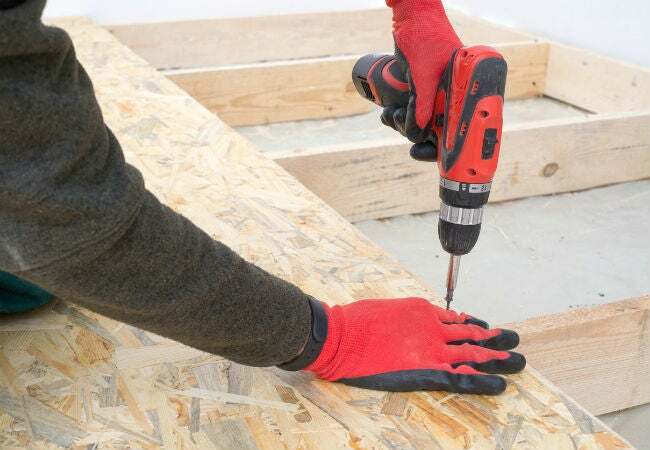 But OSB also takes a longer time to dry out, giving the trapped moisture more time to degrade the material than a quick-drying plywood subfloor. • OSB does not have the delamination issues that can plague plywood, but it’s prone to edge swelling when exposed to moisture. Though both are examples of laminated wood (meaning that each consists of thin sheets of wood that have joined with glue and compressed into a larger, rigid sheet), water damage is more likely to cause plywood’s glue to fail and its layers to bubble. This swelling effect can disappear when the plywood dries completely without impacting its structural integrity. OSB’s biggest weakness is at its edges, which will remain swollen even after the board has dried. In fact, due to the problems that edge swelling creates underneath a finished floor, a couple of national ceramic tile associations have discouraged the use of OSB as a subfloor or underlayment below a tile floor. • OSB generally costs less than plywood. Sure, the cost of any wood product will fluctuate by region and supply, but this cost comparison generally holds water. It’s the reason a good number of high-volume builders had turned to OSB. The cost of plywood will vary depending on wood species, a factor that can also affect performance. For either of these materials, enhanced versions (which are detailed in the next section, “Understanding the Upgrades”) will cost more, but the savings come in time and materials. 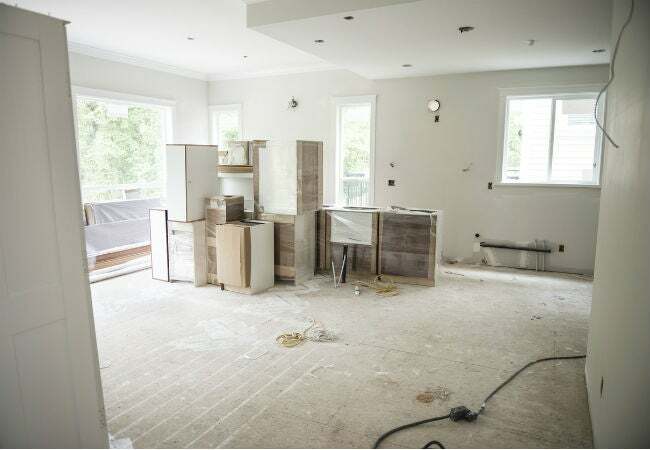 The enhanced plywood or OSB installation should survive exposure to moisture, meaning builders likely won’t need to install a partial replacement or second subfloor in order to install finish flooring. When a roofless, partially built structure takes on water, the plywood or OSB used for floor decking can absorb water, swell, delaminate, and require sanding or replacement before finish flooring can be installed. “Wood and water just do not mix well,” says Jeff Key, marketing manager for wood products at Georgia-Pacific. To address these water issues, OSB and plywood manufacturers are refining their products. The fix is to use water-repellent or water-resistant products in place of ordinary plywood or OSB. Products like AdvanTech, an OSB product by Huber Engineered Woods, were brought onto the scene to meet the need for moisture-resistant OSB. Essentially an enhanced OSB material, AdvanTech uses a resin integrated with the wood to resist water absorption and reduce the swelling that plagued the original OSB subflooring. Huber even offers a 50-year warranty on AdvanTech. Using a water-resistant subfloor product saves the builder time and money because they make compromised deck sections a thing of the past. “I use the AdvanTech sheets so I don’t have to worry about sanding the edges later,” says James Langeway, a Vermont contractor. LP Building Products offers Top-Notch, an enhanced subflooring system with an edge coating to prevent water absorption and a self-draining notch design that drains standing water away from the panels. Acknowledging that some builders are going to be loyal to plywood, Georgia-Pacific went national with a line of enhanced plywood, called Plytanium DryPly. DryPly is plywood treated with a water-resistant coating that prevents 40 percent of the absorption that occurs when uncoated plywood gets wet. “Our product comes with a 100 percent builder satisfaction guarantee against delamination, edge swelling, and joint sanding,” says Key. By combatting moisture issues, this new generation of plywood aims to go head-to-head with the enhanced OSB products. “There really isn’t another plywood product out there like it,” adds Key. This evolved plywood may claim an overall advantage over OSB, since plywood is a stiffer, longer-lasting subfloor option. It will also hold up better under flooring accidents like leaks or flooding, and has greater nail withdrawal strength to hold the nail in under stress. “The difference with plywood is not felt initially during the first walk-through by the owners,” says Key. “It is made for long-term durability.” This sentiment is backed by Georgia-Pacific’s lifetime warranty on the product.